I am very hesitant to try different cuisines, if it is not Italian, Mexican, Indian, Thai or Lebanese. Last evening when I decided to try Korean cuisine for only the second time in my life, I was not sure what to expect, as I didn’t have a good experience when I tried Korean cuisine for the first time, couple of years ago. 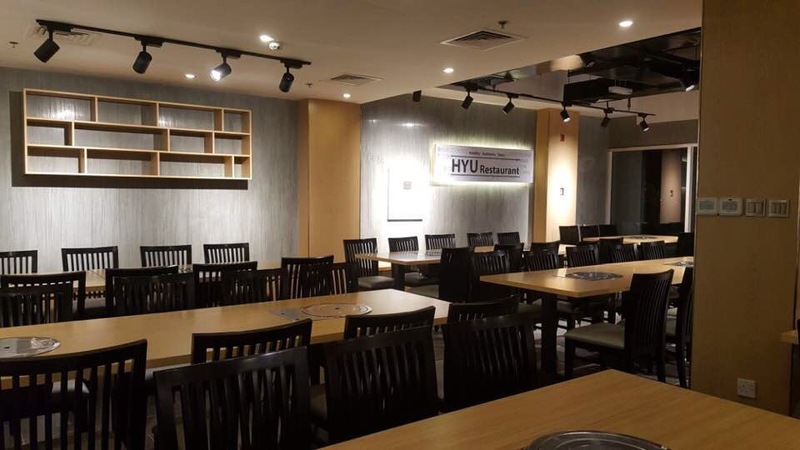 Hyu Korean Restaurant is a 6 year old Korean restaurant that relocated to Cluster O in JLT few weeks ago from its old location in Oud Metha Road. Hyu Korean Restaurant is an authentic Korean restaurant managed by Korean owners. They also have a Korean chef who follows the traditional Korean way of cooking for an authentic taste of Korea. The restaurant is spacious with basic and minimalistic decor. We found it cosy and bright. All the tables are fitted with grill for Korean BBQ. 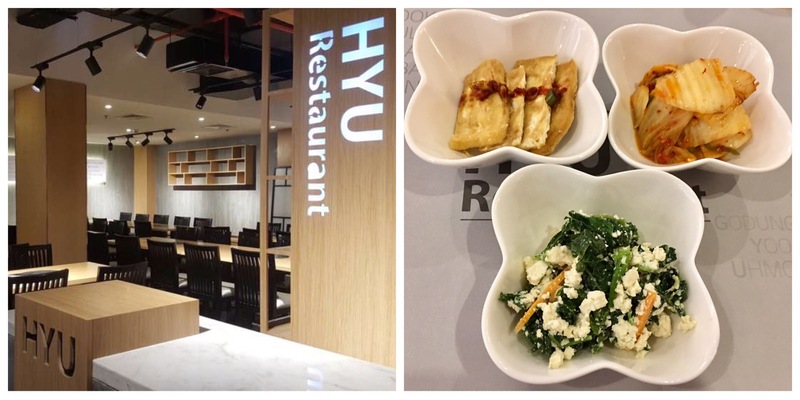 The menu at Hyu is simple and easy to choose. 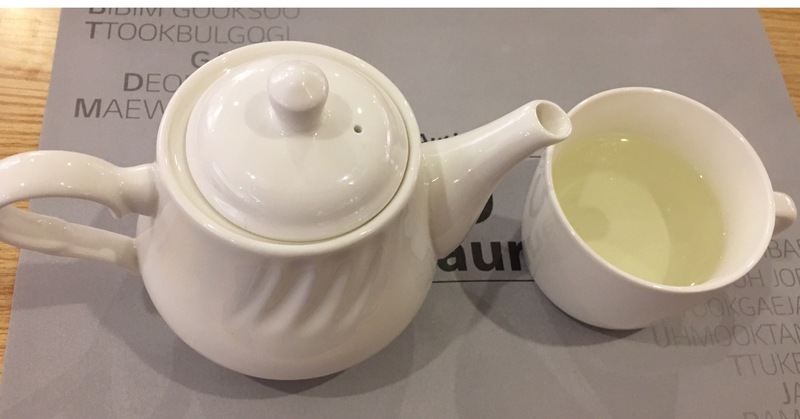 As my hubby was nursing a cold, we ordered a pot of Green Tea first. We were offered three complimentary side dishes. They came in three small bowls- Spiced Tofu, Pickled Cabbage and Tofu with Greens. According to the Korean owner of the restaurant, Koreans always have 4-5 side dishes before every meal. Little servings of these delectable side dishes were the perfect way to start our dinner. While we were chomping on the side dishes, steaming hot and very popular Kimchi Jjigae or Kimchi soup with tofu was served to our table. Kimchi soup is a favorite winter staple in Korea. At Hyu it was served in a hot pot with rice in the side. As we are vegetarians, they made us the vegetarian Kimchi with veggies and tofu. The spicy, warm, hearty and tasty Kimchi Jjigae gave us a spicy kick. It tasted good with the rice. Next we ordered the Kimchi Jeon( pan fried Kimchi pancake). Kimchi Jeon is a savory pancake made with sliced veggies and flour batter. This was our favorite dish of our meal. It was super delicious and had a great combination of flavors. 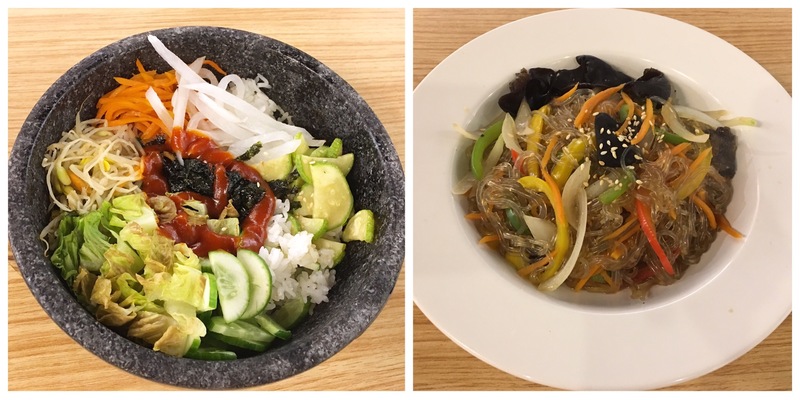 A visit to a Korean restaurant is incomplete without ordering the famous dish Bibimbap or mixed rice. This classic Korean dish was served hot on a stone pot. It had a medley of veggies, garlic, hot pepper sauce, shiitake mushrooms sesame oil, soy sauce and rice. They didn’t add the egg as we requested them not to. We absolutely loved this wholesome meal. The portion size was big and it can easily be shared between 2-3 people. The next main course dish to arrive at our table was Japche or stir fried glass noodles. The stir fried glass noodles had carrot, paprika, onion and mushroom. This noodle had a savory, sweet and nutty taste. For dessert, we tried the Korean Pie and Ice Cream Bar. The Korean Pie is a choco pie with two small round layers of cake topped with chocolate sauce and gummy bears. It was not extraordinary. Melona honeydew melon flavored ice cream bar was a sheer delight. These ice cream bars are imported from Korea by Hyu. And I must say it is one of the best ice cream candy that I’ve ever tried. I can visit Hyu, just to devour these divine tasting ice cream candy. Overall, we had a good dining experience, liked the fact that I got to learn few things about Korean cuisine. The food and the service was good. Now I know where to go, when I want to eat authentic Korean food in Dubai. Lived in Korea but I’m now in Dubai and still love Korean food so will definitely be checking this out. Thank you! That’s great. Hyu is worth visiting!